Anyway, I decided to make a list of some pokemon that are based on prehistoric animals and explain to you a little bit about the real creatures they were based on. There are more pokemon than this list that are based on prehistoric beasts, but these are my favorites. Hope you enjoy! Venusaur and its younger phases are a little tough to pin down at first. It has the term "saur" in its name, so the dinosaur bell rings in most people's heads upon hearing about it. Physically, however, it looks more like a big frog than anything else. 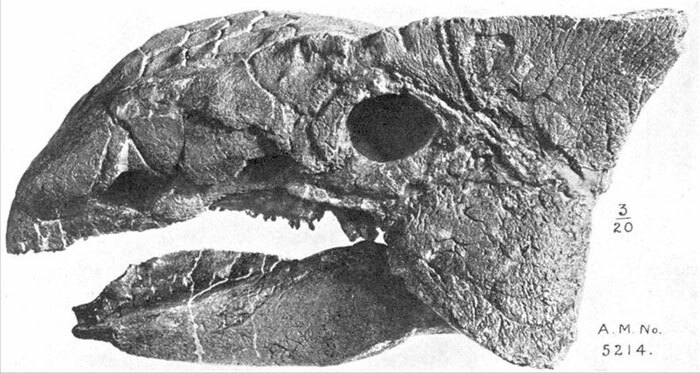 However, looking at this guy's slightly beak-like mouth, protruding teeth, and the presence of small, mammal-like ears, it could very well be based on a different kind of prehistoric creature, a kind of dicynodont. 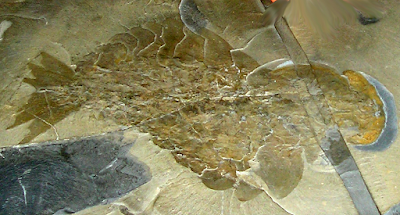 Dicynodonts of many different kinds lived during the late Permian into the Triassic period. They were not true dinosaurs, but synapsids, more closely related to more well-known creatures like Dimetrodon...and mammals. They would have waddled around on four squat legs, and had beaks with tusks they may have used to dig up plant material or invertebrates to eat. It is unknown exactly what their skin covering was like in life, whether or not they were scaly or fuzzy, or perhaps both. This might be my all time favorite pokemon, since I have been using it ever since I played the pokemon gameboy game back in the late 90s. Aerodactyl is prehistoric, even in the game, since it needs to be revived from a fossil in order to be obtained. 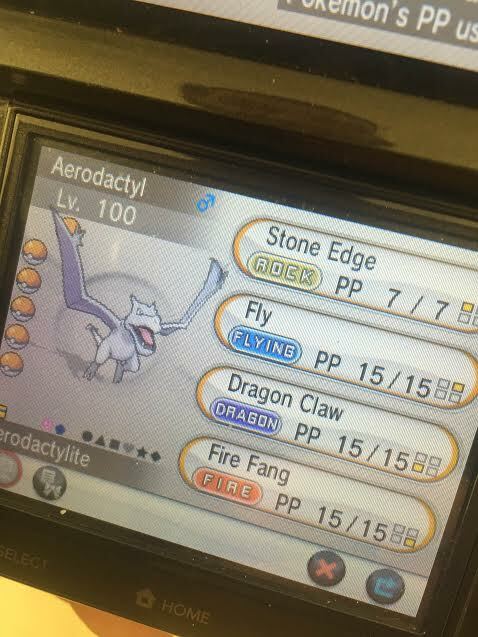 Yes, that's my Aerodactyl. I have cool hobbies. And for all you really hard-core poketrainers out there, yes, it is IV and EV trained as well. Leave a comment if you want to exchange friend codes or lose to me in a battle. Judging by the name and its looks it is clearly a stylized pterosaur...or TERRORDACTILE, as I like to call them. I have seen other people try to pinpoint exactly which genus of pterosaur Aerodactyl is based on, but I think there is a point where you need to just be okay with the idea that whomever designed this creature, was using their own imagination, too. It ends up looking more like dragon(also technically based on dinosaurs) than anything else. These guys, along with Aerodactyl, and a few others on this list, also needed to be revived from fossils in the game. They were also in the first generation of pokemon to be introduced to the world. Because of this, I was particularly impressed that two of the three kinds of fossil pokemon in the game were actually based on invertebrate fossils (vastly underappreciated even by the paleo community sometimes!) in the forms of an ammonite and trilobite. Ammonites and Trilobites are sort of the poster children for fossils that aren't dinosaurs. They are relatively common around the world and have easily recognizable shapes. Ammonites were extinct cephalopods (mollusks with big heads and tentacles like modern octopi and squid) and trilobites were extinct arthropods most closely related to today's horseshoe crabs. 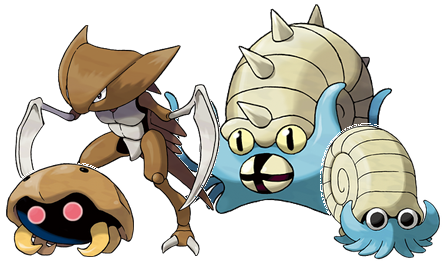 In fact, Kabutops' first "evolution" (young form...pokemon sort of dropped the ball on their definition of evolution. They should have called it metamorphosis.) looks most like a horseshoe crab. 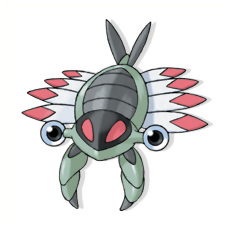 Like the above two pokemon, this guy also is based on an underappreciated invertebrate fossil. Anorith is based on an Anomalocaris, an interesting kind of, now extinct, invertebrate not really like anything alive today. They are thought to be most similar to modern arthropods, though. 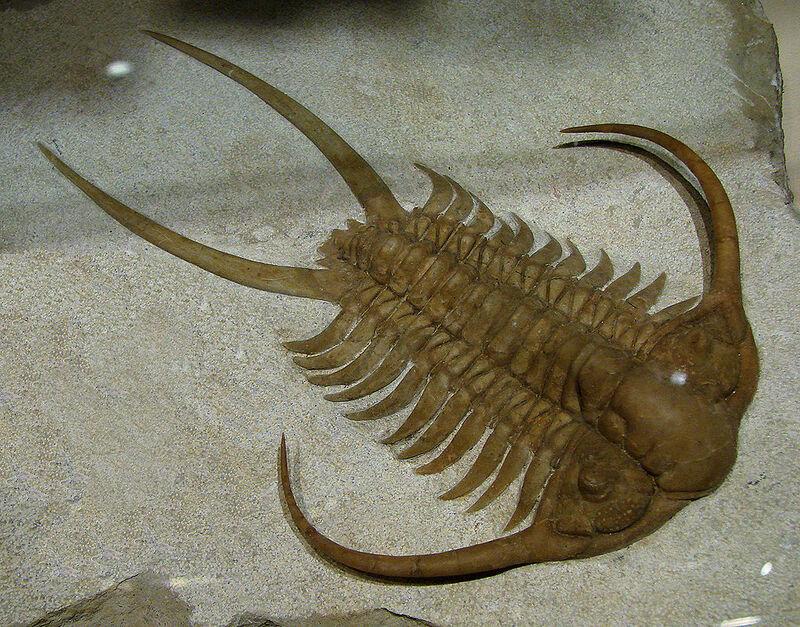 The odd, five-eyed, Opabinia, is in the same order. This pokemon "evolves" into bigger form, which looks more stylized and less like an actual prehistoric animal. 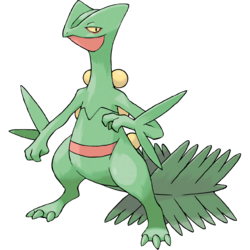 Sceptile's first form, is clearly based on a modern gecko. 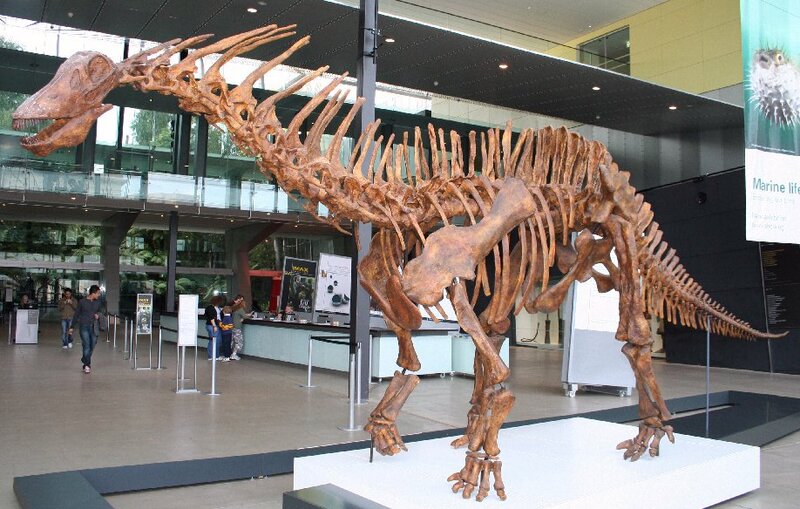 But its fully mature form shares a lot of characteristics with theropod dinosaurs. 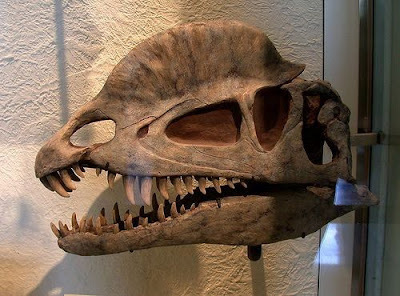 Dilophosaurus skull on display at the American Museum of Natural History. It is tough to say exactly which kind of theropod was inspiration for this pokemon. It could be argued that its based on a maniraptor because of the feather-like leafy appendages growing from its arms. I have also heard some compare it to a Dilophosaurus because of the two crests on its head. It most likely is a generally, stylized, cool dinosaur look though. 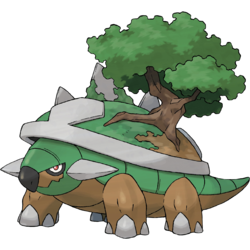 Torterra, like Sceptile, can possibly argued to have been based on a tortoise, since its younger forms are definitely based on testudines. I think it was at least partially designed after ankylosaurids, however. Yes, even the name has "Tort" in it, but look at it! It has to be those horns on the sides of the head. It really gives it an Ankylosaurus look, even if it doesn't have a bony mass on the tail. 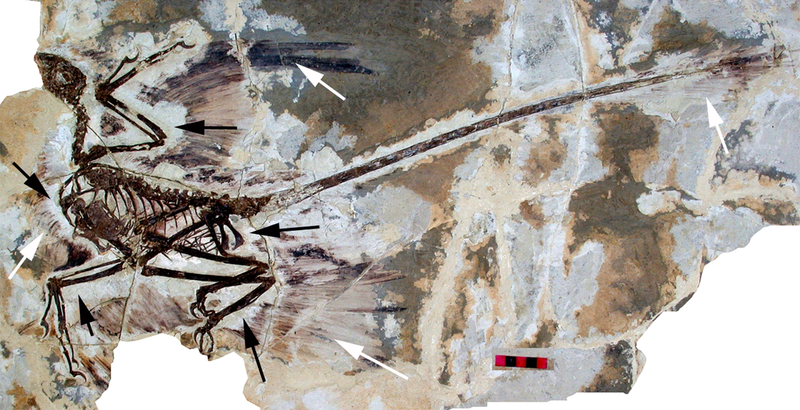 Microraptor fossil showing the feathers on the legs and tip of the tail. At first when I saw Archeops I thought it was based on an Archaeopteryx, which is the poster child for the bird/nonavian dinosaur connection. 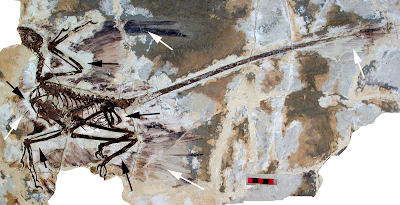 But it could have been drawn more from dinosaurs like Microraptor, since it has a skinny tail with a small fan of feathers at the tip, and long feathers on its legs. Despite being very stylized, this pokemon is an obvious nod to relatively recent fossil discoveries in the field of paleontology, which I found really cool. I love marginocephalians dinosaurs! 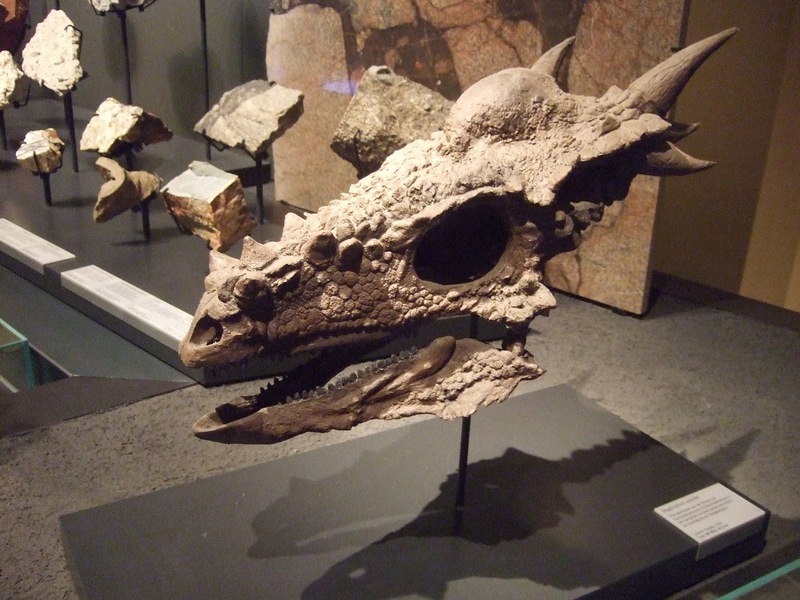 So imagine how thrilled I was back in 2006 when I saw that pokemon finally released two fossil pokemon that were based on a pachycephalosaur and ceratopsian respectively. Stygimoloch skull on display at the Museum fur Naturkunde in Berlin. Rampardos and its first form seem to be pretty nonspecific pachycephalosaurs. I have seen some try to argue that Rampardos is specifically a Stygimoloch because of its horn proportions but honestly, it's a stylized cartoon, so I wouldn't really try to pigeonhole it that much. Bastiodon, despite that ugly face, was based on some sort of long-frilled ceratopsian, like Triceratops or Chasmosaurus. I like how they made the epoccipitals look like the top of a castle. Aurorus was based on an Amargasaurus. It is pretty cool how they made the sail of the Amargasaurus, into an aurora borealis. In the game, this sail can rapidly flap like a flag. Amargasaurus skeleton on display at the Melbourne Museum. In real life, the sail of Amargasaurus was connected by spines attached to the neck vertebrae. 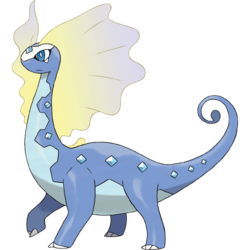 There have been few other pokemon based on sauropods, but nothing as specific as this, and a cool genus of sauropod, too! 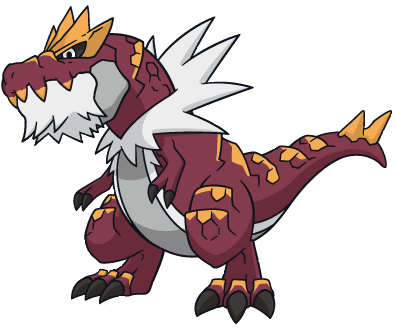 It can be argued that there have been a few pokemon based on Tyrannosaurus, before, but they look to be more based on kaijus than than real dinosaurs. That is until Tyrantrum. 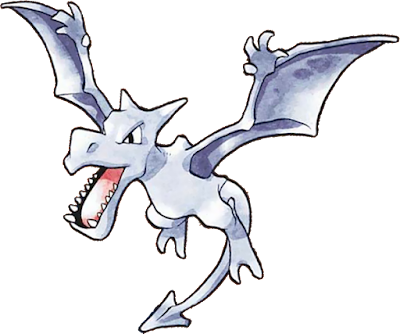 Not only does this pokemon stand horizontally with its tail balanced behind it like a real large theropod would have, but it also appears to have feathers. At least that's what I like to hope the white ruffly stuff around its neck and chin is. I could be wrong. But if I'm right, pokemon is more with the times than some science-based dinosaur reconstructions! Hope you enjoyed the list! Happy 20th, Pokemon! 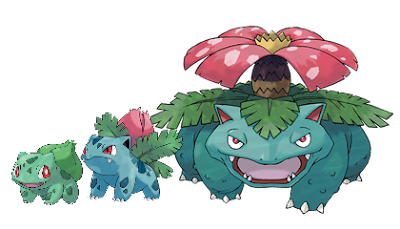 I did a blog post of my own discussing this, but in two parts (one about prehistoric pokemon and their inspirations and one about "modern" pokemon and their possible inspirations). 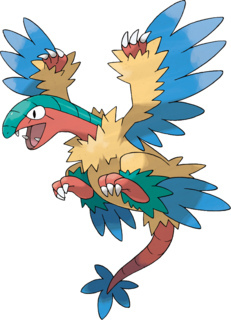 Personally, I think Combusken and Blaziken kind of look like therizinosaurs! Valuable information in your blog and I really appreciate your work and keep it up dude I really very informative blog about the paleontology.